Based on her G1 counterpart and on Baby Blossom. I've used white hair like Baby Blossom's and some pink to give it a bit extra. The gradient on her body has been done with pastels and has been sealed with Mr. Super Clear. Her symbols are two-sided and also on her forehead. Her eyes have repainted in a detailed fashion. Dancing Butterflies has been based on her G1 counterpart. Her symbol matches with the blue and pink colourpalette of her G1 version. Her detailed eyes have been repainted, adding to her sweet character. 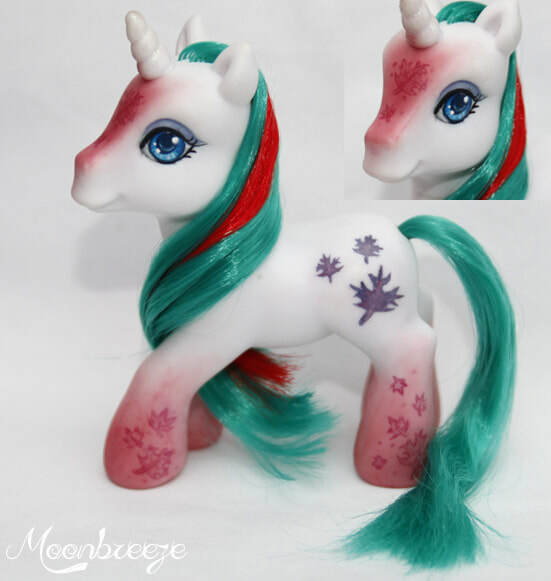 Her mane colours are the same yellow as the original although 2 light blue and pink stripes have been added. Gusty has her traditional hair colours. Her symbol has a slight variation in purple hues (one side only). Her legs and forehead are a red gradient with detailed leaves on them. Her eyes have been repainted with blue colours.